Ellington Airport in Houston is a former military base best known as being the airfield used by NASA astronauts at the nearby Johnson Space Center (JSC) for training flights on their T-38 jets. In the last couple of years, the Houston Airport System (HAS), the agency that operates Ellington as well as the city’s two major commercial airports, has expressed an interest in using Ellington as a spaceport, an interest that extends to doing the groundwork for a spaceport license application to the FAA. But who would be interested in using a facility limited to horizontal takeoffs and/or landings that hasn’t already made arrangements with other facilities, like Virgin Galactic and Spaceport America, or XCOR Aerospace and Midland Airport in west Texas? Late last week, HAS announced it had found someone who at least showed an initial interest in the site. At a press conference Thursday afternoon at the Rice University Space Institute, HAS and Sierra Nevada Corporation (SNC) signed a letter of intent to study using Ellington as a landing site for SNC’s Dream Chaser orbital crew vehicle. While Dream Chaser will still launch from Cape Canaveral, HAS and SNC will look at the feasibility of having Dream Chaser land at Ellington. From a basic technical standpoint, it appears that Ellington can support Dream Chaser: the vehicle requires the same runway as a Boeing 737 jetliner, something that Ellington, with runways currently as long as about 2,750 meters (9,000 feet) can handle. 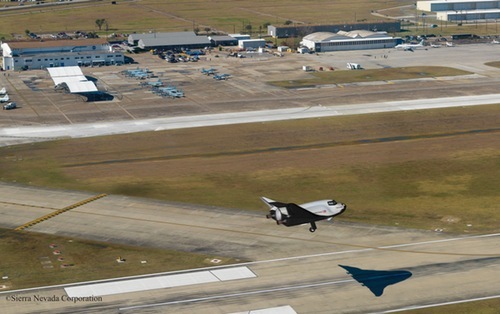 The Kennedy Space Center would remain the primary landing site for Dream Chaser, Sirangelo said, but Ellington could be a secondary site, and also allow opportunities to do things like return experiments directly to researchers at JSC or in Houston’s large medical research community. Actually, by the time HAS gets its license early next year, it might not be the ninth site with a license. Eight sites currently have spaceport licenses (“launch site operator licenses,” as they’re officially known), but others, particularly Midland Airport, are working on theirs. Midland has already completed its draft environmental assessment, a document that’s usually the pacing element of a license application. As much as I am excited by and enthusiastic for the prospect of establishing a thriving spaceport at Houston’s Ellington Field, I have to ask if we can reasonably expect to make productive use of a 9th, 10th, or 11th site for this purpose. Just as the Space Shuttle orbiter could, ostensibly and in an emergency, land at any major airport in the US or world-wide that happened to fall within its cross-range capability, future commercial flights could be recovered at any number of sites. Cape Canaveral and KSC already exists, is well situated for vertical ascents to the east, and has unique and valuable infrastructure that will go begging for use. Ellington and any other site situated in proximity to densely populated areas and civil airports with their potentially conflicting traffic patterns will likely prove to be problematic even for horizontal landing vehicles; vertical landings either powered or parachute-borne would appear to be out of the question as would vertical ascents. A spaceport facilitating polar orbit launches would be attractive in view of the forecast for more LEO communication satellites based on constellations. That’s assuming VAFB could not be made available for that purpose. Bottom line is I fear we’re setting up a “Space Authority bubble” that will collapse once the current crop of commercial space competitors thins out, becomes consolidated, and completes the required flight testing. Where we are today is akin to witnessing the first flight of the Wright Flyer in NC and immediately laying out the plans for JFK, Hartsfield, IAH, LAX, Ohare, SFO, etc. It’s putting the cart in front of a horse that is yet even to be born. As with alternate energy, tax credits, abatements, and other incentives for building capabilities and infrastructure only make sense if the underlying business/economic case makes sense without the (by design) short-term financial enhancers. I’m not convinced that I see a compelling business case for a plethora of spaceports. Ellington might prove well suited to suborbital systems that take off and land conventionally and would overfly the nearby Gulf. The apparent golden age of nano-sats that could be launched using carrier aircraft as a first stage would also be a good match, but the issue of recovering vehicles returning from orbit remains. The possibility of parachute landing in the Gulf and speedy return to NASA JSC and the Houston Medical Center via Ellington would appear to hold some promise for high value biological samples and experiments.